The Odyssey tells the story of famous Odysseus, hero of ancient Greece, and his 20 year wandering return from the Trojan War. Beset by heartache and diversion, Odysseus' story is one of adventure, glory and despair of one man's determination to return home and of the times in which he lived. Timeless in the telling, it depicts an age when mythology and truth merged into reality in literary form. The Odyssey is one of two surviving poems of the fabled poet, Homer, the postulated blind bard who kept alive the feats and darings of ancient heroes and their gods. It comprises one of oldest and finest epic poems in Western culture. This book contains a new translation by noted Canadian scholar Ian Johnston. 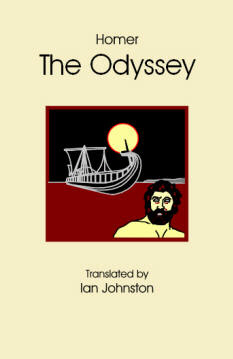 It has been translated from the original Greek into a modern English poetic form and was designed first and foremost for those who will be reading Homer's Odyssey for the first time. The translation remains very close to Homer’s text, yet the modern English idiom is extremely fluent and clear, with a rhythm well suited to the speaking voice. It’s no accident that this translation has formed the basis for dramatic presentations of the Iliad in Philadelphia and Oxford and was chosen by Naxos Audiobooks for its full-length recording of the poem (available in August 2006).